Stop and enjoy the moment with this clock that changes background scenes as you move through the day. Time has a way of getting away from us. One minute, you're starting the morning fresh and new, and before you know it the day's almost over. 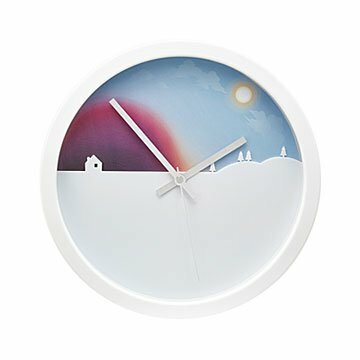 This unique clocks lets you savor the passing of time, so you might not be so caught off guard next time it starts to fly. As the seconds, minutes, and hours tick by, so does the clock's background. From dusk 'til dawn, it shows a night scene that slowly changes as the sun rolls in. Then, it shows a daytime scene that progresses toward sunset as the evening approaches. Whether you're hard at work or just busy with life's little everyday tasks, remembering to stop to enjoy the moment can be as easy as checking the clock. Made in China. 2.24" W x 9.96" dia. I love the design and look of the clock. It is on the lighter side. Really disappointed that it isn't reliably put together. When I opened up the clock and put the battery in I noticed the hour hand was loose compared to the rest and would just dangle. After emailing in and getting a second one it had the same problem. I was able to get the second one hour hand back into its "groove" for it to stick (for now) but it took an unreasonably long time to fiddle with it. I love the design and concept of this clock! But the materials are cheaper than I was expecting -- the frame is lightweight slightly translucent plastic and the background is a piece of paper, though it's not too noticeable from afar. But the biggest disappointment, which may be my fault because I'm not used to analog clocks, is that it ticks fairly loudly. It is VERY noticeable in a quiet room, even a large one. As someone used to a peaceful quiet, this was a real irritant and it prevents me from putting it in any bedrooms or other places where quiet might be desired, which severely limits my display options. I'd much rather it be seen and not heard. But I do love it as a kinetic art piece, so I'm going to keep it and figure out the best place where it can be frequently seen without disturbing the peace. This clock is neutral and looks good anywhere. It's fun to watch as the time changes.